1798 girls need your support to stay in school. We need to act, and we need to act now! The Issue: It is the end of the academic year and more and more girls are in danger of dropping out of schools. In fact, 4.6% of girls drop out between class 7 and 8 in India every year. This is because of reasons like poverty, harassment, unsafe environment and with many girls being considered a ‘liability’, they are forced to marry early. Also, many parents don’t see value in girls completing their education. What does this mean for these girls? Often, they have to discontinue their education midway and thus remain more vulnerable to violence and exploitation. What We’re Doing: We’re launching a 6-week campaign to raise funds for a special drive in our intervention areas across four states (Haryana, Uttar Pradesh, Bihar and Jharkhand), focused towards preventing adolescent girls from dropping out of schools. This includes working with parents, community members, schools and children themselves to make them realise the value of educating girl children and to address barriers like harassment that prevent them from going to school. How You Can Help: We hope to raise 22,00,000 INR, which is the amount we need to effectively run this special drive, to prevent 1798 girls from dropping out of schools. These girls are in class 7th and 8th currently and would drop out if they don’t get your support. The next 6 weeks are crucial because once they drop out, the possibility of re-enrollment stands reduced. You can Donate to the campaign and help us reach the target amount. 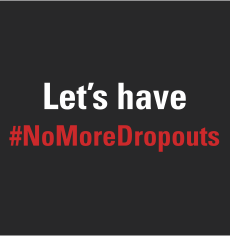 Let’s ensure that there are #NoMoreDropouts. Note: All donations made to Breakthrough India are tax exempt under Section 80G.